Sure that could pass if you are doing lazy keto. << Insert sarcasm and judgement. How many times have you been in a facebook group and have someone post “is this keto?” only to see the above response? If you’ve been involved in the keto community for a while, you know there’s a lot of controversy and debate around the topic of “what is keto” and what isn’t. Every forum and page is rife with this sort of comment. 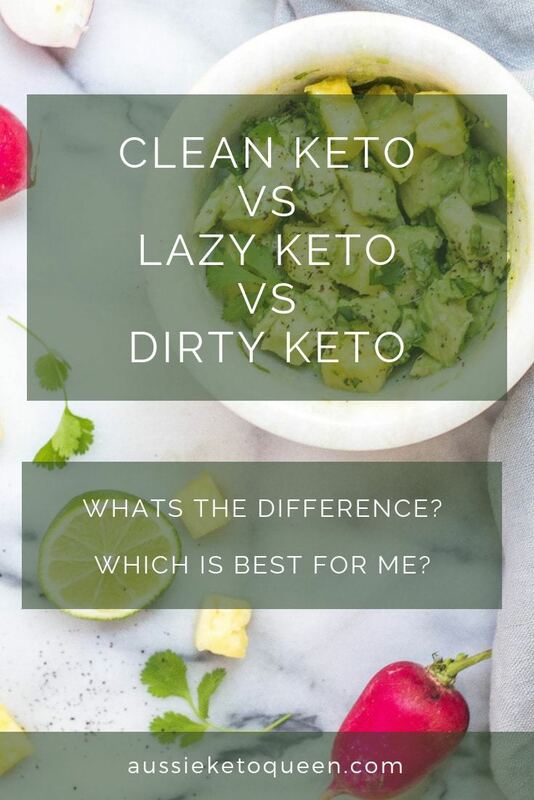 Well, I’m here to hopefully shed some light on why this is a constant battle, so you can make the decision on which ‘style’ of Keto is right for you. First, let’s look at what each version of Keto might look like so you can work out which one is going to work for YOU. Strict Keto or Clean Keto is, for some people, the ONLY way to tango. There are no variations, it is an all or nothing kind of approach. It is strictly, 100%, on plan, no cheats days, no substitutions and no compromise. People who practice the Strict Keto way of eating (WOE) get their foods only from “clean” sources. We are talking about local, organic, grass fed beef. Organic veggies. Cage-free, soy free, free range, royally treated, gold encrusted eggs. Strict Keto eaters also often avoid dairy as it can be inflammatory for many people. Strict Keto can often mean meticulously tracking macros and avoiding processed foods of any kind. No more Quest bars if you’re on this bandwagon guys. 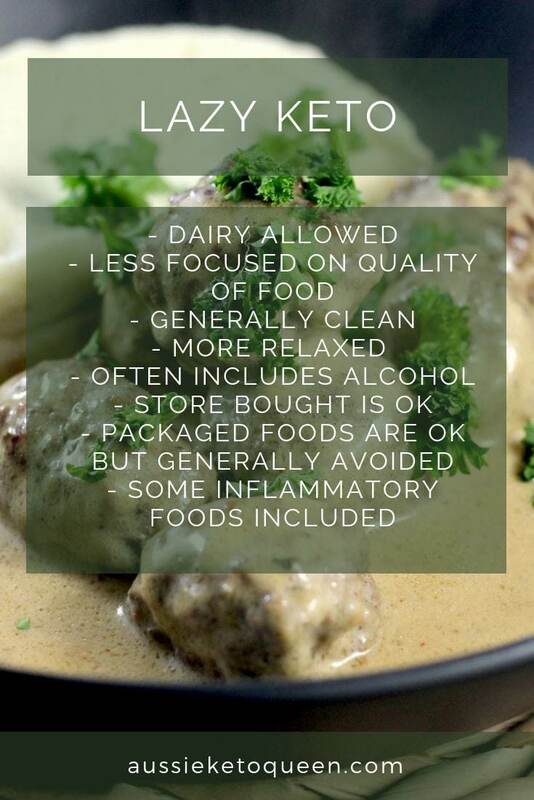 This style of Keto can work really well for those who have experienced IBS, PCOS and health problems relating to carbohydrates. I write about PCOS and Keto further here if this affects you. In my experience, it seems to suit people who have an ‘all or nothing’ personality more than most people. I talk a bit more about this in my article about The 4 Tendencies and Diet – How your personality can affect your keto success. These people are generally the Upholder personality type, meaning once they are convinced of something there is no swaying them and they can stick to a plan 100%. The downside is, this can often lead to judgement of people who are not as strong willed or who might need a bit of coaching and support along the way. It can also be a pretty expensive way to eat in the long run. 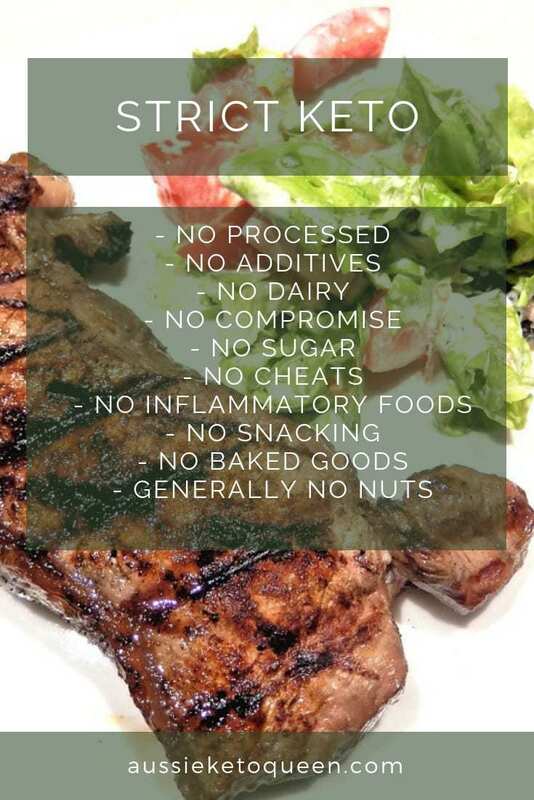 A typical diet for Strict Keto might look something like this. This is obviously just a simple example to give you an idea. Lazy Keto is probably the most common, easiest to follow version of Keto. This style is best for those who want to see the surface results of the ketogenic diet like weightloss and energy levels, but don’t want to devote every second and dollar to strict keto. Lazy keto tends to involve keeping your ingredients mostly whole and clean, and usually not tracking anything outside of carbs. People doing lazy keto might not be AS concerned about grass fed beef vs. “regular” beef. They also may use packaged dressings that are simply low carb; actions which often cause some raised eye brows from the Strict Keto eaters. They keep their daily carbs under 20g of net carbs a day, but often don’t track calories. This tends to be one of the more popular forms of keto. You have the strictness required to see fast results, but you wont tear your hair out obsessing over every little detail. The downside of Lazy Keto is that you usually hit a ceiling on the benefits you see. You will often get a flatter stomach, lose body fat and feel better overall, however I know from my own experience that as you get closer to a goal weight range you need to tighten up your belt if you want to… tighten up your belt further. This often sees Lazy Keto people start to review what else could be causing them to hold on to the last few kgs to reach their goal weight. Of all the different types of keto, this is by far the most controversial. This is the one that really gets those keto groups riled up and angry. Choose your facebook groups and forums carefully if you are doing this style of Keto, or be prepared to feel the same. Dirty keto is essentially not concerned about ingredients and only concerned about carb intake and macros. 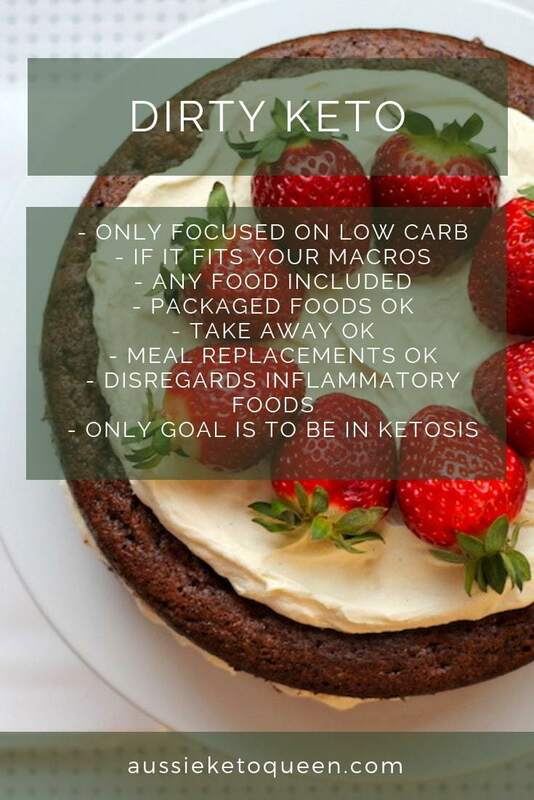 Basically it is the ‘If It Fits Your Macros (IIFYM)’ version of keto, so if it keeps your carbs where they need to be, and you are in ketosis, then you are doing it right. This means you could be eating processed protein bars, pre-packaged foods, take away food. As long as it fits your macros and you are in ketosis then you are winning at it. The downside of Dirty Keto, and to a lesser degree Lazy Keto, is that it does not acknowledge inflammatory foods. As inflammation is linked to more and more diseases and health concerns, I personally don’t think it is something I can ignore for my own health. Here’s what a typical day of eating Dirty Keto style might include. You’ll notice plenty of packaged foods and take away. Which style of Keto is right? The Keto diet WORKS but it’s only going to work if it is something you can do for the rest of your life. I am strong believe on eating as many vegetables as possible, and most people find once they are keto adapted, they tend to lean towards fresher foods anyway. Eating packaged foods, baked good replacements etc isn’t the end of the world. Because here’s the thing – just like veganism and vegetarianism, this is a food choice. You are choosing what you put in your body, according to your own health goals and lifestyle. We are not FORCED to keep our carbohydrates low, even if it is better for our health. We are not allergic to carbs and most of us are not allergic to preservatives or food colours, so this is a choice like anything else. I say to those who are unsupportive or judgemental (or down right rude) to people doing Lazy/Dirty Keto – every vegan probably looks at your diet the same way you look at Lazy keto. Bear that in mind and approach every question with the kindness and acceptance you would like to be given yourself. We are all on our own journeys here. I revolve between all 3 styles. Most days, I am strict keto with some dairy. On weekends, I relax a bit and will enjoy some lazy or even dirty keto meals. You will find recipes to suit every style of keto in my repertoire, so really it is up to you to choose. What style of Keto do YOU do? Comment below! Useful article! I am middle of the road as I eat cheese, but have found the carbs in green veg a big shock. My treats to myself tend to be brassicas and the occasional 🍅. Also don’t understand the use of cashews and chick peas in many recipes. They are beans and so very high carb? Think I have to be very careful about recipes. Yes you definitely have to be careful. I use cashews very occasionally but many recipes listed as Keto are far from it. Well it seems im a mix of all 3. I consifder myself strict because i track meticulously and stick to set macros. There are some foods ill never eat but not nevessarly those on your list. I also do 20 total not net carbs. But i do eat dairy and drink diet soda et. I do eat cheese but am conscious of their calories and carbs. I know I should avoid inflammation but I like the main culprits. Don’t want to eat anything sweet that could cause cravings. Everyone needs to adapt diet to suit them, nobody should be judgemental of others. Just allow everyone including yourself to do what is best for themselves. I was taught long ago to not disparage another’s food. That said, I’m all 3 depending on where I am and how I feel. No sugar, bread, rice, pasta, candy, and baked sweets. Never drink cokes and don’t have a big sweet tooth. I track using carbmanager.com and keep it pretty consistent. 70-75% fat, 5-8% carbs, and 18-25% protein. I do drink wine upon occasion, and my sweet treat is peanut butter or dark chocolate. Sounds like a great, balanced approach Robbie! I agree with not disparaging other’s foods, we never know what they are going through or what their goals are.